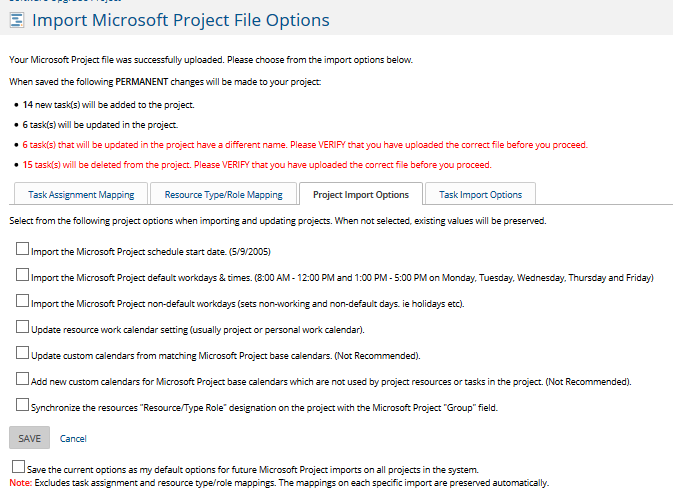 During the process of adding or editing a project, you may select the Import from Microsoft Project option. When you click Save on the project, the Import Wizard will start. 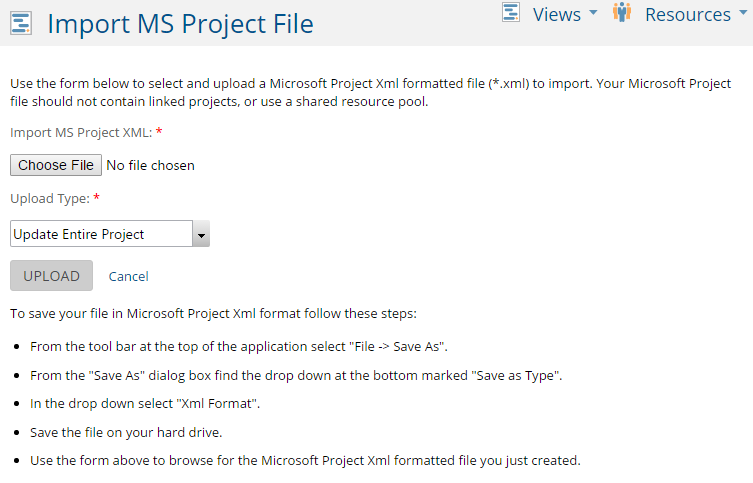 Import MS Project XML using the browse button, locate the XML file to be imported. If your project was not saved as an XML file you will need to open it in Microsoft Project first and the use the save as XML option in Project to create a file that can be imported. Upload Type defaults to updating the entire project. You may also choose to add only new tasks if you are importing into an existing project and want all tasks in the import to be appended as additional tasks to the existing tasks within the project. Upload will load the project and open the next step of the wizard. At the top of the page, above the mapping tabs there will be IMPORTANT INFORMATION that you should review before proceeding. Note that once you save from this page, your changes will be PERMANENT. For a new project this notice will include only new tasks. For existing projects, it might include a message as to how many tasks will be deleted and how many tasks will be changed. You must not save the import if you do not want these changes to occur. The mapping options for imported resources will appear only if the imported file contains resource names in its resource sheet. Import and map Task Assignments from the MS Project file to the corresponding person enables you to map from the MS Project to the Project Insight Users using the drop down list. If unchecked, no mapping will occur. Partially Mapped Task Assignment Handling select from the drop down options how to handle tasks that can not be fully mapped. Assign the unmapped work using a default mapping (best practice is this option, then you can individually assign these tasks to the right resource later. At the bottom of the page is an option to save your mapping choices for future imports. In addition to or instead of using resource to resource mapping, you may choose to map users to a Resource Type/Role. 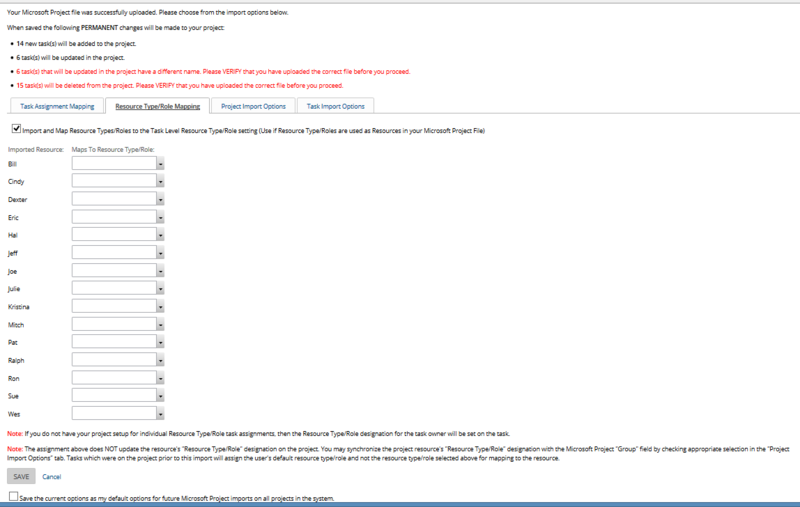 Import and map Resource Type/Roles to the Task Level Resource setting use this option if Resource Type/Roles are used as resources in your MS Project file. 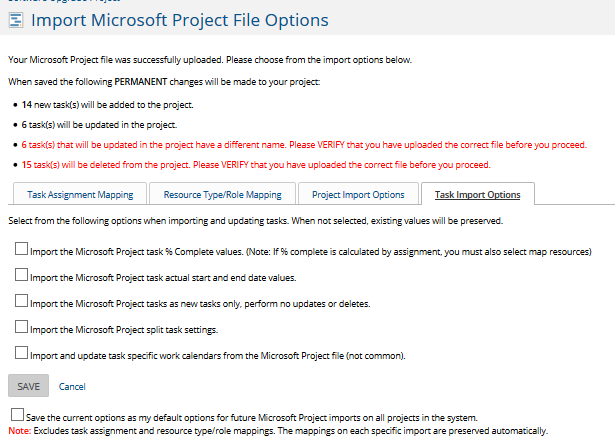 Map the MS Project Resource to the Project Insight Type/Role using the drop down list. If unchecked, no mapping will occur. The project import options allow for settings which are not normally recommended, but may be useful on occasion. The task import options allow for settings which are not normally recommended, but may be useful on occasion. 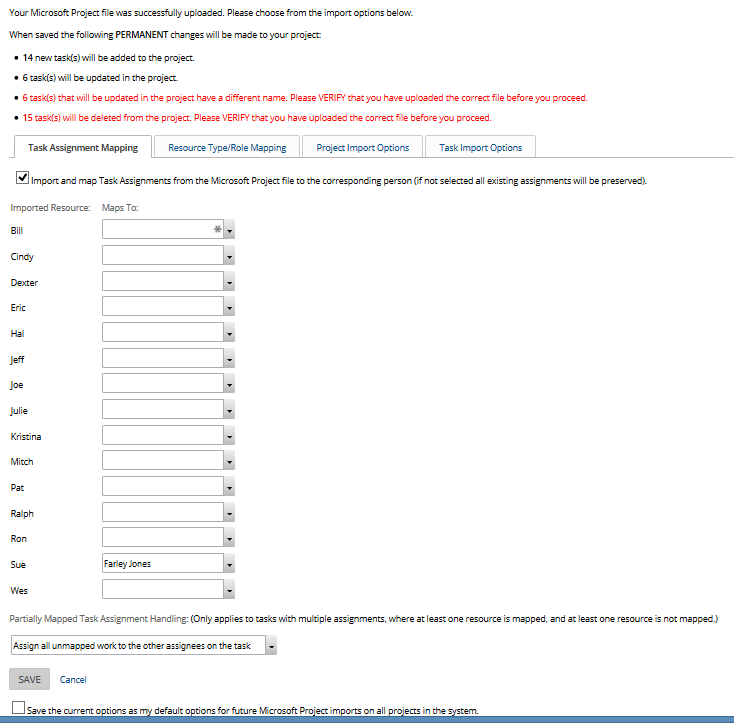 See additional information on import and export considerations in the FAQ titled Microsoft Project Import/Export.